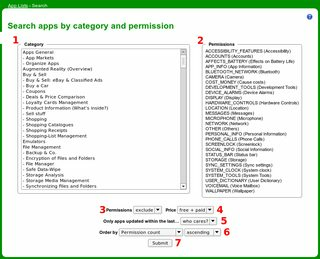 How to search the Play Store by permissions? How do I specify that I do not wish to see apps that require for example internet access? Or to only show apps that use a specific permission? A specific repository with search on its webpage? An app that provides searching the Play Store? If you're interested, I've developed an app, StripSearch, to filter search listings by the permissions used. The app works by excluding results that don't meet the permission requirements specified by a given search filter (a filter can exclude, require, or ignore specific permissions). Several filters are included by default, but you can create your own as well. As the second screenshot shows, you can select what permissions your wanted app is permitted to have (checkbox marked), and what permission it should not have (checkbox unchecked). However: While this can be used to filter out apps with unwanted permissions (e.g. show only apps whitout the Internet permission), you can not restrict your results to the opposite (e.g. show only apps with Internet permission). The app clearly targets at users concerned about their privacy/security -- and according to the review (I just found it a couple of minutes ago, so I could not test it yet) it does a very good job. As it's already a year ago, and the promise on the APEFS Homepage (GTransed to English, as their own English version doesn't have that statement in the first paragraph) seems not to be fulfilled anytime soon (the app is still offline): Please consider the web-based solution from my other answer as an alternative meanwhile. For almost 4 years now, I maintain listings of „Android apps by purpose”, i.e. grouped by their use cases. In march, I started moving them to my own server. All MetaData are stored in a database on that server, and so finally I was able to setup a search by permissions. You can select between 1 and 5 categories here (note that selecting a „parent category” automatically includes all its „children”), plus one or more permissions. Default presets are for finding „permission-friendly apps” – so if you're after such a candidate, you can simply submit the form after having made described selections. This should make it easy to e.g. find a PIM app which does not request the Internet permission (to keep your personal data on your device). However, the opposite is possible as well: If you e.g. want to investigate what good NFC can do for you, select the up to 5 categories you're interested in, then the NFC permission, switch the „Permissions” dropbox to „include”, and optionally the sorting to „by rating, descending” (to get the best-rated apps first). When in doubt, there's that little question-mark icon in the top-right corner, providing you with some „online help”. So you can compare them not only by rating, but also pick the one requesting less permissions (number in the box; in above image indicated by a „red 6”) or, if possible, without any concerns (no red border around the box). Clicking the app's name reveals some more details, as shown. And there are many „easter-eggs” (i.e. 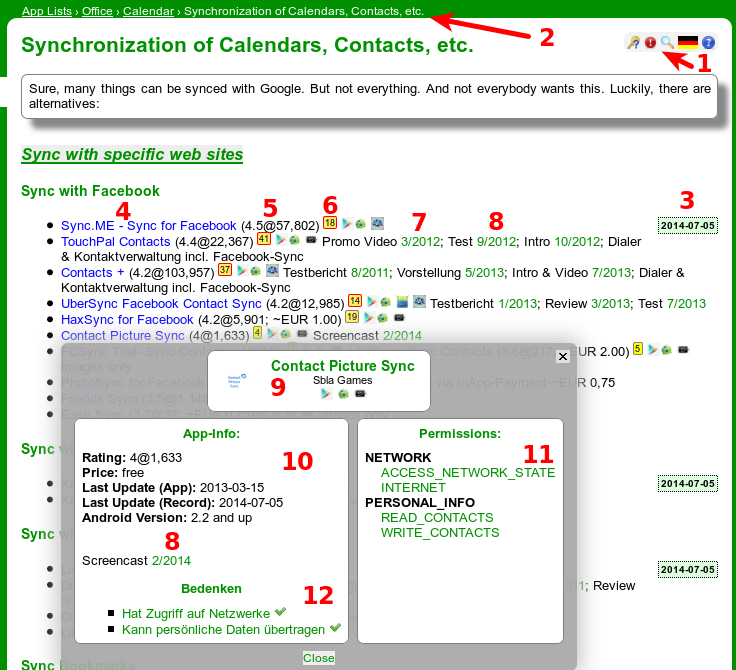 MouseOver events) – again, be pointed to the help page. Full disclosure: As initially indicated, the described site was designed by me, built by me, filled by me with its content, and is further maintained by me. It's available bi-lingual (English/German), free of any charge (this includes: no cookies, Flash-cookies, whatever), etc. This question here at Android.SE was one of the reasons I've set it up. Further be aware of the fact that this doesn't cover the entire „playstore collection”. As of today, there are a little over 10,000 apps recorded in the database (which is probably a little less than 1% of what's on Play – unless you don't count the crap, fakes, and useless apps on Play, then my records might cover about 10% ☺). Still I hope (and think) it's already a useful resource you'll enjoy. When a developer performs the upload of his application to Google Play, the application manifest file gets read to a database, from where the search for apps is performed. To allow searching for applications based on their permissions, one would have to access the database and collect data that concerns the application manifest node <uses-permission>, previously read from the AndroidManifest.xml file, where the developer has declared his application permissions. Strictly, Google Play does not filter based on <uses-permission> elements. From the Filters on Google Play Filtering based on Manifest Elements - <uses-permission>. Essentially, Google Play Store uses the application manifest file to automatically apply filters based on the user's device, hardware specifications, country, carrier, etc. All of this is done silently without the intervention of any search parameters. A user either from Google Play or third party search engines, can limit the results after they get automatically filtered by Google, based on personal preferences like excluding paid apps; limit the results to apps that are compatible with the user devices, among others. But there's no way to interfere with the filters applied by Google. Even if, some how, we get to that part, the API essentially isn't prepared/designed to filter based on permissions as mentioned above. Simple answer: you don't. Though you can feel free to ask Google. As user Chahk said, the web interface saves you a few clicks, but there is still no way to filter results as you are requesting. A round about way is to create a Java app that utilizes android-market-api. Presently it can search app based on "keywords or package name". The search query can be built to search for the necessary permission that is being sought. Little homework required, but seems useful. You have to replace X.Y with 0.6 as that is the present version and replace credentials and query. For building query you can visit this page. If you have programming skills you can write your own parser and use filters above it. I couldn't find anything about API but you can slowly parse web-interface to get what you want. It's not the simpliest solution but can make you much confident with results you can get. Honestly I wish I could make simple example in Python but have no time now. Maybe in nearest future. For example :"COARSE (NETWORK-BASED) LOCATION" -> searching for this will list down applications which have this information listed in their descriptions, but it fails to search through the Permissions tab. Im currently working on a permission based search filter for the Android Play store. For now I have found over 1.2 Mio Apps and added their permission to my database. How does the Webservice work? (I have no affiliation with the app - I had the same question and this was the solution I ended up using). None of the solutions mentioned here are working as of Feb 2018. So I created my own simple solution which I will document below. Create a folder called appSearch, for example. Sign up for an account on AppBrain. Then go to your dev dashboard. It will prompt you to enable the Developer option for your account. Navigate to the API access page. Now download filter.js and save it to the same ('appSearch') folder. Run the following command: jjs -scripting filter.js -- keyword, where keyword can be any search term. You should see a list of 50 apps that match your search term and are sorted by the number of permissions, with a link to their play store page. Edit: The code in filter.js is relatively simple and can be tailored to suit your own criteria, if you know a bit of programming. I will try to make it more configurable in the future. The free tier allows limited number of queries per day. 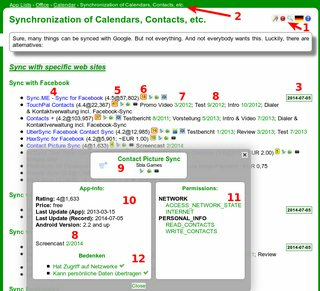 Still, you will be able to make about 30 searches per day, which is enough for personal use. Not the answer you're looking for? Browse other questions tagged google-play-store permissions or ask your own question. Where can I find the ANDROID_ID on my device? 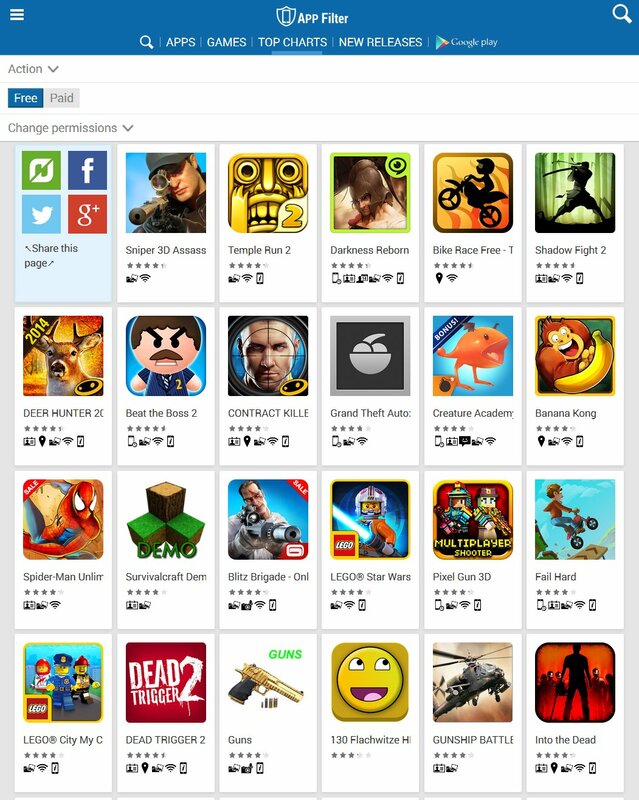 How do I distinguish apps with in-app purchases from completely free apps on Google Play? How do I find out alternative apps from Play Store that have same functionality and LESS permissions? How to tell the Play Store to list apps in different languages? Which BusyBox is legitimate on Play Store? Will I be granted system level run-time permissions if I put apk in /system/app or /system/priv-app on 6.0+?